Restaurant Jauja looked like it should be in an Alpine region of Germany or Switzerland, but so goes the immigrant influence in Argentina. 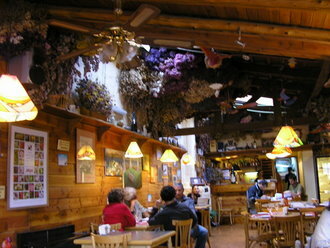 Massive amounts of dried flowers hung from the ceiling. The half timbered stucco, stone and glass structure with pine furnishings house a restaurant and an artesian ice cream and chocolate shop. Rather than being “tourist kitsch,” it’s totally El Bolson. I had lunch with two young friends from the British Isles, allowing me the opportunity to sample three entrees at once. I had a venison goulash. Mark had Patagonia trout with mushroom sauce and Leah had braised rabbit. 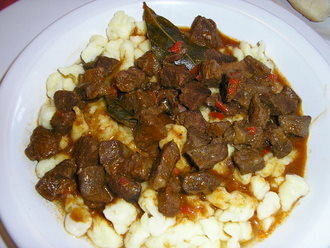 The venison goulash was over gnocchi but, unfortunately, I was under whelmed. It needed salt, pepper and some of El Bolson’s wonderful fresh herbs such as rosemary. The addition of their terrific mushrooms would have added an elegant addition. The trout was well grilled and the mushroom sauce flavorful. El Bolson’s farmers dry much of their mushroom crop intensifying the flavor. 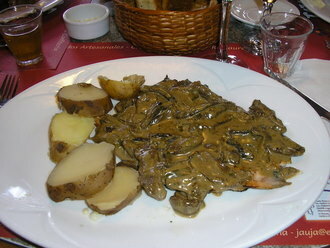 The sauce was a simple cream reduction with the rehydrated mushrooms. The dish was accompanied by simple boiled potatoes. Patagonian trout holds up well under the intense flavor of sauces. Leah’s rabbit was the outstanding entrée of the three. It’s presentation was a visual delight and could be a true signature dish for Jauja. I would like the mixed julienne of vegetables to be more al dente. The rabbit had been excellently braised in red wine with thick slabs of smoked bacon. It was tender, rich and earthy. 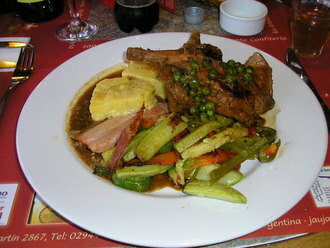 Accompanied by slices of polenta and the colorful mixed vegetables it was stunning. The entire lunch for three people, including the wine, came to AR$135 (US$ 36.50). For dessert we bought three small squares of dark rich artesian chocolate at their shop. A perfect end to a good lunch.